Building on an earlier USAID project that identified success criteria for developing sustainable, replicable CE service enterprises, this project integrated them into a toolkit used to educate USAID energy staff on best practices for successful CE development programs for SMEs; assist government stakeholders in promoting CE SME programs; and support entrepreneurs in adopting successful business models and attracting investment capital, including monetized carbon offsets in voluntary or compliance markets. With E+Co., the “best practices in action” activity developed a web-based distance learning program to disseminate the toolkit and provide training materials and business planning support relevant to SMEs; launched a demonstration project using the best practice set of tools and models to support enterprise-based CE services through technical and business advisory assistance; and conducted four two-day workshops on policy, regulatory and market issues, business approaches and financing, carbon financing, and the toolkit in Ghana, Senegal, and Tanzania. AEAI developed a carbon primer; assessed barriers to CE SME development imbued in policy and regulatory frameworks and made recommendations to overcome them; and provided training on potential policy/regulatory supports for government, NGO and private sector participants. 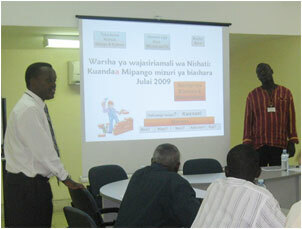 AEAI did carbon assessments of biomass resources for validation of Tanzania projects. AEAI also provided and discussed a detailed set of recommendations to the Tanzania Rural Energy Working Group in a special workshop. The project achieved financing approval for more than 10 projects during the project term (with many more subsequently), and validation of two CE SME carbon offset projects. Berkeley Air Monitoring Group did carbon validation in Ghana and Tanzania.